Trying to think of something different for your kids' birthday parties? Shudder at the thought of all those youngin's running around your house? Tired of your family members complaining there's nothing fun about going to family reunions? Need some fellowship activities for your church, club, or place of business? 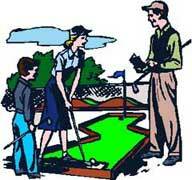 Li'l Mississippi Golf would love to host your next birthday party, company picnic, church outing or family reunion. Special group rates are available pending on the size and time your group outing is held. Reservations are required to receive group rates.